Hidden in the high plains of Castilla y León in Northern Spain, the regions of Ribera del Duero and Rueda possess an unusual beauty. The landscape looks alternately like the beach, the desert or the moon. The climate is almost inhospitable to human life. But in these harsh conditions indigenous grapes thrive. In Ribera del Duero, Tempranillo — a hearty, thick-skinned version of its cousin in Rioja — survives scorching summers and frigid winters to produce bold red wines of incredible depth and structure. In Rueda, the vines of Verdejo grapes feed off the rocky soils to yield herbaceous, aromatic whites. There’s something timeless and untouched about the culture of Castilla y León. Here sustainability isn’t a trend, it’s a tradition. Before they were “discovered” by the outside world, many local producers were making wine simply as a labor of love, not a path to prosperity. That DIY spirit continues today. In Ribera and Rueda, wines aren’t fashioned by focus groups and consultants, but by small family farms doing what they’ve been doing for generations. As any experienced traveler knows, you can always judge the authenticity of a restaurant by the number of locals in the dining room. Apply that logic to Spanish wine, and all signs point to Ribera and Rueda. Crisp, citrusy Rueda Verdejo is Spain’s most popular white wine. The heavenly pairing of Ribera reds with roast pork and lamb have made them a celebrated staple of local gastronomy. Yet, with broad and growing appeal, their days as Spain’s “best kept secret” may be numbered. 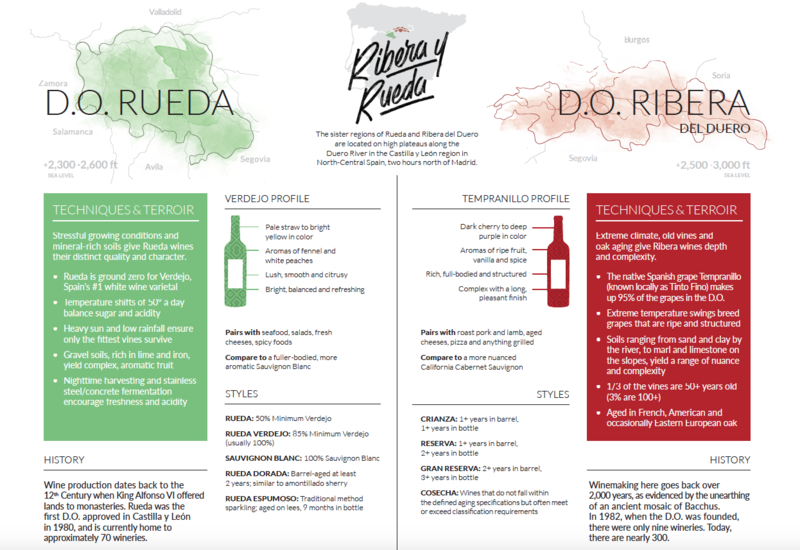 Both refreshing Ruedas and robust Ribera del Dueros serve as a more sophisticated step-up from what many Americans are already drinking. This combination of authenticity and accessibility arms wine sellers with a rare double threat. One that is equally suited for intrepid oenophiles looking to further explore Spain, and novices beginning to baby-step their way into the intimidating world of real wine.